The defence should not be left to generalist administrators or to purely military users who may not factor in India’s overall geopolitical needs and vulnerabilities. Not surprisingly for an election season, there continues to be a rising crescendo of comments and counter-comments about the agreement entered into with Avions Dassault to get 36 Rafale fighter aircraft. Some explain the difference in price as being the consequence of the 36 aircraft needing to be configured to carry a nuclear payload on deep-strike missions in enemy states. Technical experts could testify as to how much more it would cost per aircraft to configure it to carry a nuclear rather than a conventional payload in terms of the weapons loaded, and as there are several such individuals in India, it is time that they revealed their financial and technical calculations, so as to give greater clarity to the debate. The per aircraft cost for 36 seems much more than for 126. Can the argument be made that this was because the configuration needed to carry on board non-conventional weapons required a much more expensive refit than what is needed for aircraft carrying only conventional weapon payloads? We do not know. The unit costs being substantially more for the specially-configured 36 aircraft than for the 126 may be the consequence of the French supplier needing additional funds in order to finance an upgrade of the existing M 88 engine of the Rafale. This is relatively underpowered when compared to other fourth generation fighter aircraft. Also, the present model of the Rafale does not have stealth capacities. Does the pricey variant supplied to India include this additional feature? The reality is that any boosting of the capability of the Rafale engine is an expensive process, and Dassault has been in a parlous financial situation. It needs to be remembered that in modern warfare, any air rather than missile attack by the IAF on a major military power would run the risk of being exposed to the air defence network of that country. Should the target country have systems such as the Russian S-400 that India is also purchasing, the risk to attacking Rafale fighter aircraft would be substantial. Even cruise missiles can get intercepted by the Russian system. The S-400 is a superb anti-aircraft system, especially if the country that is the target of an IAF attack has been given a system that features the latest Russian missiles. It is not clear that India too will get the latest Russian missiles for its S-400s or will acquire only older models for the air defence systems that are being purchased for an initial cost of $5 billion. There was a time when Moscow and Delhi were as close as Beijing has long been to Islamabad, but that era has long passed, which is why the continued heavy reliance on Russia for critical defence needs requires a relook. India’s defence is way too important to be left to generalist administrators or to purely military users who may not factor in the overall geopolitical needs and vulnerabilities of the country. The problem facing the defence procurement system in India is that the users (i.e. the wings of the military) seem not to be given financial parameters and limits while designing their specifications for weapons systems. As a consequence, they may configure specifications in such a manner that only the most expensive models would be eligible, as took place in the MMRCA process. This would be analogous to a motorist being asked to choose the vehicle he wants, irrespective of cost. He would naturally choose a Ferrari or a Maserati, rather than a Volvo or a Toyota. The MMRCA program is designed to replace the MiG 21s, of which over 400 have been in service for the IAF. In order to have both an effective defence as well as credible attack capabilities, at least around 200 more aircraft are needed to be acquired in the near future. A mere 36, no matter how magnificent each fighter aircraft may be, is not sufficient. In such a context, the offer by the US to transfer the entire F-16 assembly line to India should be seriously considered. The F-16 variant being offered to India is the latest and contains weapons systems and avionics far superior to the aircraft supplied to Pakistan. Locating assembly lines in India would ensure that the IAF get the 200 additional fighter aircraft it needs to be a potent strike force, while additional aircraft could be sold to other countries so that such sales subsidise part of the costs of making and equipping the F-16s destined for the IAF. Without the offer to relocate production lines to India, the offer of F-16s was rejected in the past, and correctly so. However, entering into the manufacture of the airframes for such aircraft would open the way for future manufacture (jointly with the US) within India of more advanced models, thereby adding to both local jobs as well as skills. It may also be possible to persuade corporations such as Northrop Grumman, Raytheon and BAE to set up facilities in India to manufacture radar, electronics and weaponry for the F-16s that are locally manufactured. The airframe accounts for only around a third of the total cost of production of a frontline fighter aircraft, and the rest comprises other items, most of which can be made in India. Our country and the US need to enter into a much closer defence and security relationship, which is why it would make sense in geopolitical terms to acquire the THAAD anti-missile system on the same terms as offered to South Korea, as well as Patriot PAC 3 anti-aircraft systems. Hyper-reliance on a Russia that is today closest to a China that is still much too cosy with Pakistan seems a risk. India’s defence is way too important to be left to generalist administrators or to purely military users who may not factor in the overall geopolitical needs and vulnerabilities of the country. Just as China makes a necessary partner for India in commerce and economics, so does the US in defence and security. 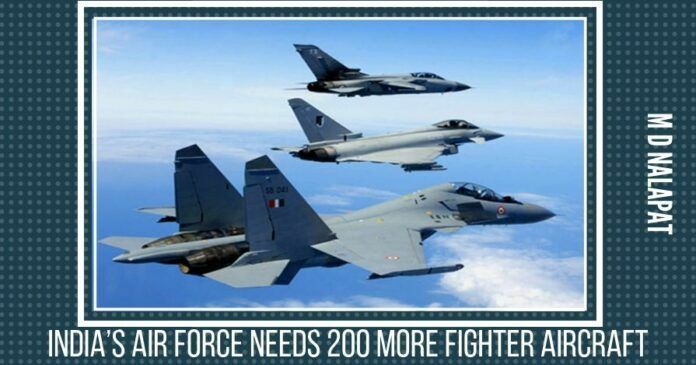 The IAF needs a minimum of 200 frontline aircraft to ensure sufficient attack and defence capabilities. The transfer of F-16 production to India, followed by the transfer of part or whole of production facilities for more advanced fighter aircraft and subsequently their equipment, makes more sense than looking at every critical defence need and corresponding purchase in isolation. Madhav Das Nalapat (M.D. Nalapat) is an Indian academic and columnist. Currently Editorial Director of The Sunday Guardian and Itv network (India), Vice-Chair of Manipal University's Advanced Research Group, and Director of the Department of Geopolitics, Manipal University. He has been the Coordinating Editor of the Times of India and editor of the Mathrubhumi. He is the son of renowned author and poet Kamala Das. Nalapat writes extensively on security, policy and international affairs. Defense forces should spend their budget every year by default & NOT postpone its purchases waiting for the best to arrive. buying bamboo stick in time is better option that endlessly waiting for M-4 Carbines. India for long had policman or office clerk or lawyer as its defense minister. Time has come for a professional who is from defense strategist background. Generalists / Journalists both have ruined India.